It's amazing the difference a remix can make - not only to how good a song sounds but also to its chart performance. 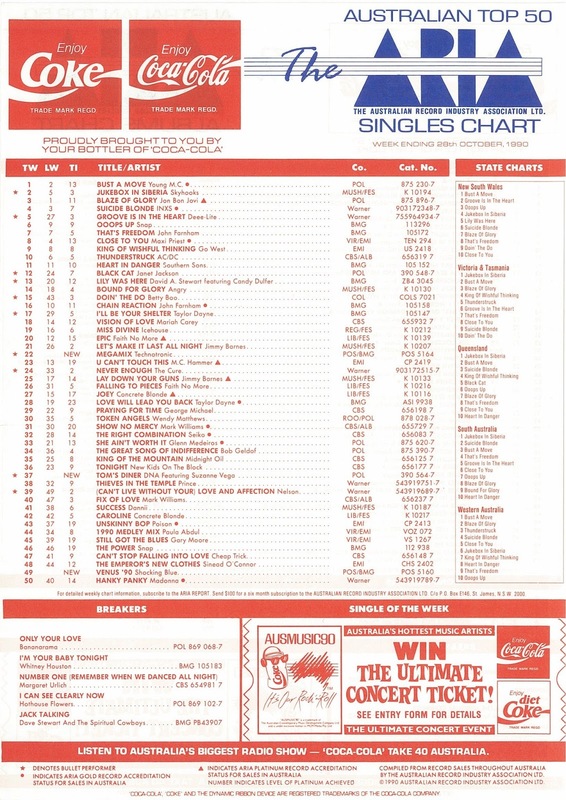 There have been countless examples over the years of a single suddenly leaping up the chart after some studio remodelling, but the story of the song that entered the ARIA chart this week in 1990 is slightly more complicated than that. Not only was the track in question originally released back in 1987, but it was completely transformed, shifting the song from one genre to another and, in the process, opening up the singer to a whole new audience. It was also kind of annoying - well, to me, anyway. In other news, there was a new number 1 single this week in 1990. After slowly but surely making its way up the chart, "Bust A Move" by Young MC became only the second rap song to reach the top of the Australian singles chart. As a bonus, it dethroned "Blaze Of Glory" by Jon Bon Jovi. So, win win. After a string of top 40 hits dating back to their live version of "Am I Ever Gonna See Your Face Again", The Angels were relegated to the lower reaches of the chart with this latest single from Beyond Salvation. Formerly known as Westside Posse and sometimes just as Sound Unlimited, this Sydney hip-hop group was the first local rap act signed to a major label. Mainstream success was still some way off. Speaking of first signings, this Sydney band was the first to join the roster of Chris Murphy's rooArt label - but this single would be their only top 100 placing. There was no use even pretending anymore that 1927 weren't hurtling down the dumper - with this third single and title track from their sophomore album their lowest charting single to date. Here's another Australian band struggling with their second album - with the performance of this lead single from You Lucky People (which sounded like all their previous hits rolled into one) signalling the beginning of the end for Big Pig. Finally, Australia came to its senses and also abandoned the Reid twins in droves. Not even a cover of the Roger Miller classic (number 16 in 1965) could propel Charlie and Craig back up the chart. While I was happy enough to see the latest from The Angels, 1927, Big Pig and The Proclaimers miss the top 50, one former hit group that I was disappointed to see falter was Bananarama (aka my favourite girl group of all time). Having (mostly) moved away from the Stock Aitken Waterman hit factory (for the time being), Sara, Keren and newest member Jacquie went all experimental with their sound. Co-written and produced by Youth, "Only Your Love" was the lead single from Bananarama's fifth album, Pop Life - and in between its musical references to "Sympathy For The Devil" by The Rolling Stones, its samples of Primal Scream and The Stone Roses, and its dimly lit music video, it was like nothing the trio had released before. Seemingly, it was a step too far away from the pure pop sound the group had stuck to for the previous four years. "Only Your Love" didn't just receive a tepid reception in Australia - in the UK, it became the group's lowest charting single since 1987's "A Trick Of The Night" and when the British version of Smash Hits put Bananarama on the cover in 1990, it was, according to a friend of mine who worked there at the time, one of their lowest selling issues ever. Peaking just two places above the latest Bananarama single was a new mix of the song the girl group had famously covered in 1986. Originally released by Shocking Blue in 1969, "Venus" had topped the Australian chart in March 1970 for two weeks. Twenty years later, that guitar-based version was given a dance remix, complete with the obligatory "whoo... yeah" James Brown sample heard in countless tracks at the time. Having charted in late August, the BHF mix of "Venus" had been competing on the top 100 for the previous two months with another version of "Venus" released by Don Pablo's Animals - a record which actually originated from the same production team as the Shocking Blue remix. In the end, this version won the chart battle. Next up, another song benefitting from a dance remix - but unlike "Venus", "Tom's Diner" hadn't been a hit when it was first commercially released in 1987. 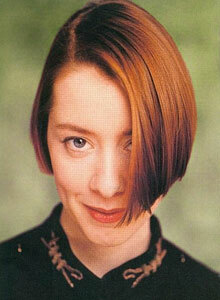 Written half a dozen years earlier, "Tom's Diner" was finally included on Suzanne Vega's second album, Solitude Standing, in two forms - one a cappella and one instrumental. That might have been that had the vocal version not been laid over a dance beat by producers/remixers DNA. The duo's bootleg of "Tom's Diner" became a club hit before being snapped up by Suzanne's record label for an official release. And just like that, the folk singer suddenly had a massive chart hit on her hands. As much as I liked dance music in 1990, I couldn't get into "Tom's Diner". I found the "do-do-do-do" vocal hook irritating and I much preferred Suzanne in her guise as occasional chart visitor thanks to songs like "Left Of Centre" and "Luka". Seems I was alone, since the single became a worldwide phenomenon, also reaching the US and the UK top 10. The original version also went on to play a pivotal role in the development of the MP3, as discussed by Suzanne herself here. Rounding out our club mix triple play is the inevitable megamix from Belgian dance act Technotronic. As medleys go, "Megamix" was one of the best around. Yes, matters were helped by the fact that the four Technotronic singles to date all kind of sounded the same, but some care had been taken to ensure this was more than just some roughly cobbled together cash-in. "Megamix" worked as a song in its own right, with the best bits from "Pump Up The Jam", "Get Up! (Before The Night Is Over)", "This Beat Is Technotronic" and "Rockin' Over The Beat", as well as some fresh samples, all worked in to a cohesive track. The single was also one of the best performing megamixes, matching the number 13 peak of Rococo's "Italo House Mix", and beating similar (but shoddier) releases by Paula Abdul, Bobby Brown, Black Box and Snap! Next week: watch out, Mariah - the original big balladeer is back. Plus, two hair metal band debut with new songs, and a song that's hit the top 50 for three different artists debuts in its most unique version. Australian rap/hip hop just doesn't 'work' for me. The accent sounds jarring when rapped. I don't think I'd heard the Sound Unlimited Posse track before. Never heard the Crash Politics one before either. I thought 'The Other Side' was the best single from 1927's second album; but still not as good as the '...ish' singles. 'Justifier' is another flop Australian track destined for heavy rotation on the Summer Bay Diner jukebox. Being played on that jukebox was almost a curse. I liked earlier Proclaimers singles, but never cared much for 'King of the Road'. 'Only Your Love' might have fared better if it was titled 'Never Let Me Go', as it's repeated so many times in the song. While probably one of their best singles, the vocal performance is a bit lacklustre, I think (well, even by their standards). I'm pretty sure the Rams got a front cover on the local edition of Smash Hits, too, around this time. It's strange that 'Venus '90' charted higher than a new Bananarama track. Mariska Veres looks like a doll in certain scenes of the video, so heavy is her make-up. I think 'Tom's Diner' may actually have been written as early as 1981. I remember reading an article about it somewhere (or maybe it was on wikipedia) where the reference to the actor she hadn't heard of who'd died while he was drinking can be pin-pointed to particular news article from that time. I like the 'Tom's Diner' remix, but it seemed a bit too easy to have taken an a cappella track and just plonked it over what is basically a Soul II Soul backing track. Suzanne started a mini-trend of female vocalists being sampled/remixed for unlikely dance smashes in the 90s (Kate Bush, Tori Amos). Snap! 's megamix was probably my favourite, but the Technotronic one wasn't bad, and was mixed well. Man I LOVED Rhythm Rude Girl! One of the first songs i wanted to learn on guitar in 1993!